Changing signs and various adjustments that were made in his absence in early spring have left Joh with his work cut out for him. Some are returning from injury (Walker, Corcoran), some have been hit hard (Lowe, Messenger) and others have pleasantly, unexpectedly, surprised (Ardsma and Kelley). Then there’s the old vet Miggy who is trying to make his case by experience and health (that he lacked last season). The praise just keeps on coming for Lopey…. Last year with the Mariners was a banner season offensively for Lopez, even as he did it in relative anonymity. He batted .297, hit 17 homers and drove in 89 runs. 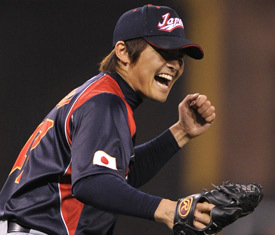 He then went and played 28 games in his home country over the winter, hitting .349 and driving in 34 runs. RRS (aka “the Hyphenator) – rotation or relief? One of the bright spots late last season, Ryan just working to improve. “Every start I learned something new about myself,” Rowland-Smith said. “I’m slowly learning what kind of pitcher I am and maybe the end of this season I can come back and say this is the kind of pitcher I am. 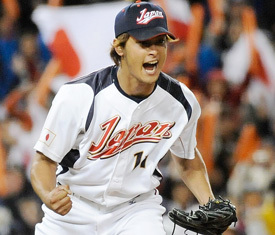 WBC | Congrats to Team Japan! Wakamatsu said he hoped the four could bring some of the passion he saw on the field and in the stands at the WBC to the Mariners. Hernandez thought that was a good idea. Lopez waxed almost poetic when asked about playing for Team Venezuela. Chavez was just as happy. Much as he enjoyed playing with other Venezuelans, Chavez said he was anxious to get back on the field and in the clubhouse with the Mariners. Johnson’s ability to work with pitchers, block the plate and throw runners out as part of an all-around defensive package has now vaulted him into the picture when it comes to making this Mariners team. Heading into camp, it appeared Jeff Clement was a shoo-in to make the squad and possibly supplant Kenji Johjima as the No. 1 catcher. But that’s been changed by the signing of left-handed slugger Ken Griffey Jr. — who would take potential designated-hitter at-bats away from Clement on days the latter isn’t catching — and the emphasis on defense by the team’s new coaching staff. Clement’s defense remains a work-in-progress and his bat — despite a single in an 8-5 win by the Mariners over Oakland on Saturday — has yet to take off. Johnson’s bat has never been touted as his meal ticket, but his defense appears more polished than Clement’s. Wakamatsu, a former professional catcher, liked how involved Johnson was with pitchers in a Seattle loss Friday. Johnson was also involved in three separate tag plays at home plate in that same game. Balentien stumbled through his rookie season, got sent back down to the minors for a prolonged stint, then finished the year with a terrible .202 average and .592 on-base-plus slugging percentage. The holes in his swing that had previously plagued him in the minors were evident in Seattle and he spent months trying new techniques with former hitting consultant Lee Elia behind the scenes. This spring, he’s trying different drills with hitting coach Alan Cockrell and appears to be having some success. Balentien came out of Sunday’s game with 14 hits in his first 36 at-bats this spring, a .389 average. Inflated spring stats don’t mean all that much, but the team is breathing easier now that Balentien is making contact. The Mariners know they might have to pinch-hit for Chavez late in games and need an outfielder who can come off the bench and play solid defense. Balentien is versatile enough to play all three outfield positions without being a defensive liability. But the ticket to his sticking with the club was always going to involve showing improvement at the plate. Q: Why conduct the World Baseball Classic? A: The World Baseball Classic was created to provide a platform that will increase worldwide exposure of the game of baseball and further promote grassroots development in traditional and non-traditional baseball nations. The tournament’s primary objectives are to increase global interest and introduce new fans and players to the game. The World Baseball Classic acknowledges and pays tribute to the tremendous growth and internationalization of the game. I have never been one to claim to know a players heart or drive – different players have different motivations – some, maybe most, are playing for national pride. Others for the love of the game, still others may find it a more intense, complete way to prepare for their professional season. While it is evident that most pro-athletes are very competitive by nature, I don’t know that any of the players, no matter the country they play for, has any grand illusions that if they win this tournament that they are “the best in the world”. If they win this tournament, they performed the best in this tournament. Just like the team who wins the gold medal in the Olympics performed the best in the Olympics and the team that wins the NCAA Tournament performed the best in that tournament. I’d even go so far as to say that the World Series winners are the ones that performed the best in that particular series (or three). Granted, to get to the WS a team has to perform at a very high level all season long, but I’m sure many would agree that it’s not necessarily always the best team that wins the WS – it’s a good team that gets hot at the right time. I think it’s good just where it sits. I’m not sure how it could possible work in the middle or at the end of the MLB season. What player is going to want to leave a team in the middle of a pennant race to play in a tournament? The break in concentration and/or momentum wouldn’t be fair to their professional team OR their WBC team. How many players would be able to adequately represent their country in November when they are physically and mentally spent after a marathon season? I would argue that, no matter what time of year they play, they will NEVER be able to assemble each and every “best” player. Various things, including team situations, personal circumstance and injuries, makes that an impossible task. As a side benefit, while some of the best are representing their countries, it actually provides more playing time for those back at camp. Managers and coaches (and fans) get a better look at those who are vying for jobs than they might have had otherwise. To be expected since this thing is only in it’s infancy. Here are some topics likely to be discussed for the next go ’round in four years…. It’s a splendid idea in need of some tweaks, but overall seems to be serving it’s purpose.